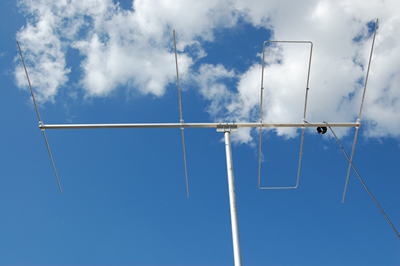 Today I am pleased to announce the launch of the new Loop Fed Array (LFA) Yagi antenna. 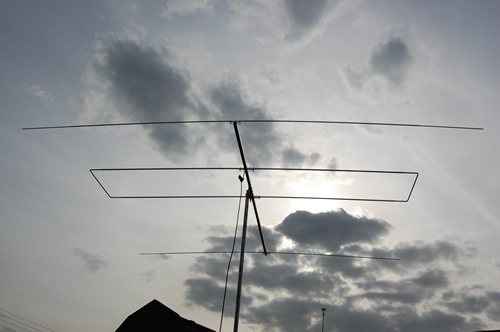 The LFA Yagi is not fed with a dipole as would be traditional Yagi antennas. Instead it is fed with a full wave loop which is laid flat on the boom between the Reflector and first director elements. DUBUS Magazine has the exclusive release of the details into this antenna with some of the first models although I will be releasing build-yourself-models and full information on performance and how it works in the very near future. 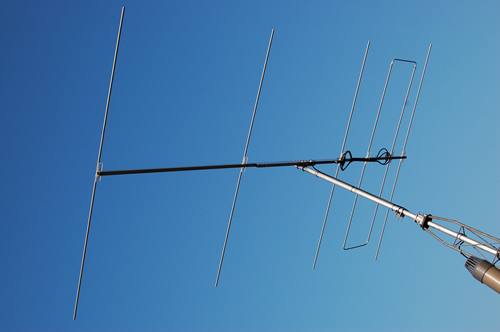 In short, the LFA provides superior performance over the traditional Yagi in many areas and provides a platform which provides Quad and Yagi features in one visually pleasing package. 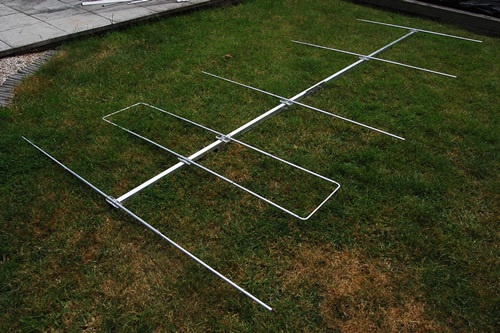 Please bookmark this site and check back over the comming weeks for details of how you can build and own one of these exciting antennas! The above 3 element 28MHz LFA is now installed at M5ADX. First 'on air' tests against a CB 18 foot vertical showed a signal increase from S1 to S9!when switching to the G0KSC LFA. Above is the 5 element 50MHz LFA in use now at G0KSC. 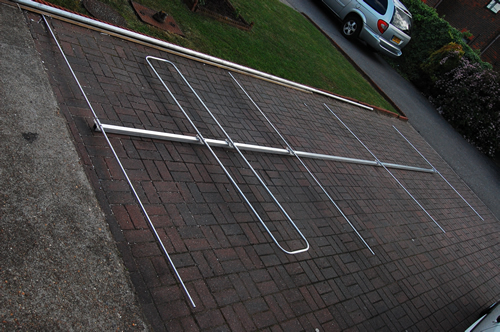 This antenna is 4.7 metres long, has just over 11dBi forward gain and 22dB front to back ratio at worst. More importantly, the antenna shows a 1:1 flat SWR curve from 50 to 50.50MHz and a return loss no lower that -30dB down, peaking at -60dB down! With all LFA's fine tuning is made easy by the end pieces of the loop being made out of a smaller gauge tubing and hence, a trombone effect allows the loop to be increased or decreased in size. Tired of all that noise you pick up from around your own home and other building near where you live? This is the first of my new Low-Noise LFA Yagis. Massive suppression side lobes in both the H and V plane means minium local noise pick up and minimum interferance when transmitting. 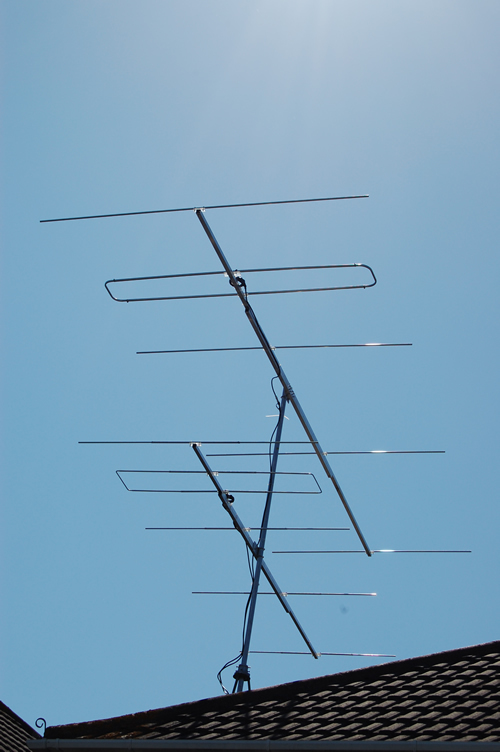 Details on this antenna and others like it will be in the next issue of DUBUS Magazine. 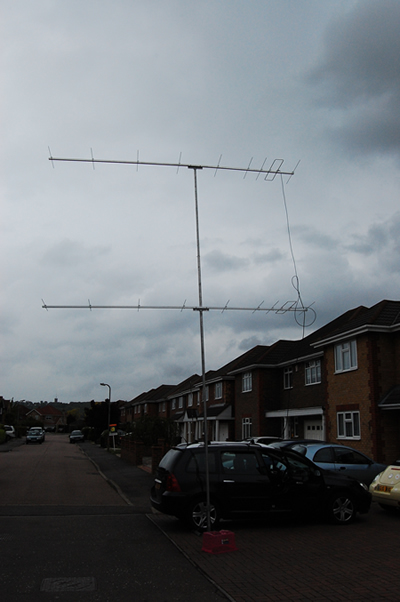 The above antenna is a 5 element LFA for 50MHz with a 6.6 metre boom made from 1.5 inch box section tube. Elements are 16mm thick while the loop is 22.23mm thick with 19.05mm end sections. 11.5dB Gain, 28dB Front to REAR. The suppresion extends forwards by 15 degress in order to remove straight up and straight down lobes. If you are not into building Antennas..
www.vinecom.co.uk - Vine Antennas are going into production with the LFA so check their site out and give them a call with what you are looking for!